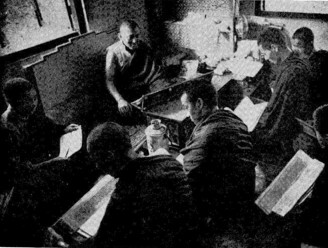 Khenpo Dawé Özer (Tib. མཁན་པོ་ཟླ་བའི་འོད་ཟེར་, Wyl. mkhan po zla ba'i 'od zer) aka Khenpo Dazer (མཁན་པོ་ཟླ་ཟེར་, Wyl. mkhan po zla zer) (1922-1990) — he was from Rahor, a branch of Dzogchen monastery founded by the Third Dzogchen Rinpoche in Gyalrong near Dergé. He was a student of Pöpa Tulku. He escaped from Tibet together with his former classmate Rahor Khenpo Tupten and went together with him to Sikkim via Bhutan. He taught at Namdroling in South India, where he also compiled a collection of prayers and liturgies used in Nyingma rituals, and eventually returned to Tibet, where he taught at the Shri Singha Shedra at Dzogchen Monastery. This page was last edited on 26 October 2011, at 09:48.